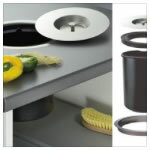 CP Kitchen Components are one of the UK’s leading online stockists of waste and recycling bins. 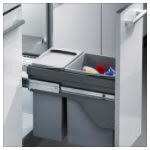 Whether you’re looking for a freestanding or integrated waste bin we will help you out. With one of the largest selection of bins and styles across the UK to choose from, you’re sure to find the right one for your kitchen. Nothing spoils the effect of your stylish kitchen more than an untidy and overflowing bin. Our products are designed to look aesthetically pleasing whilst still keeping your kitchen hygienic and tidy. 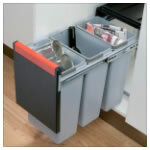 Our range of integrated bins can maximise storage efficiently whilst still looking simple and modern. The range includes front fix door, worktop and hinged door bins in a range of different colours, models and styles to suit your kitchen perfectly. We know the importance of recycling as, there’s a pressure on everyone to ‘go green’ and managing household waste is becoming more difficult. Helping you recycle efficiently whilst also saving time, our bins come with different colour lids to make it easier for you to recycle and do your bit for the environment. Purchase any of our products today online to immediately freshen up your kitchen! 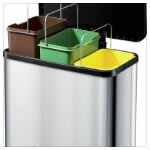 If you would like more information about our range of waste and recycling bins, call 01706 365 366 or email our sales team on sales@cpkitchencomponents.co.uk.